Before Mrs. Abington was a leading actress playing roles such as Lady Teazle, she was just a simple flower girl and busker. Fanny Barton, as she was known then, soon after gained employment with a French milliner which proved to be beneficial because she learned both French and the art of costume. It is unclear as to the specifics, but around this time she had gained employment in a brothel, something that would be publicized later during her celebrity. She got her big break in 1755, acting in the Haymarket. Her career took her to Ireland where she enjoyed great success and could only be lured back to England by the coaxing of the theater-genius, David Garrick. By this point Frances had married; the lucky man was her music teacher, a James Abington. The marriage gave her the name that made her famous: Mrs Abington, but it also gave her a lot of grief. It was not a happy marriage. 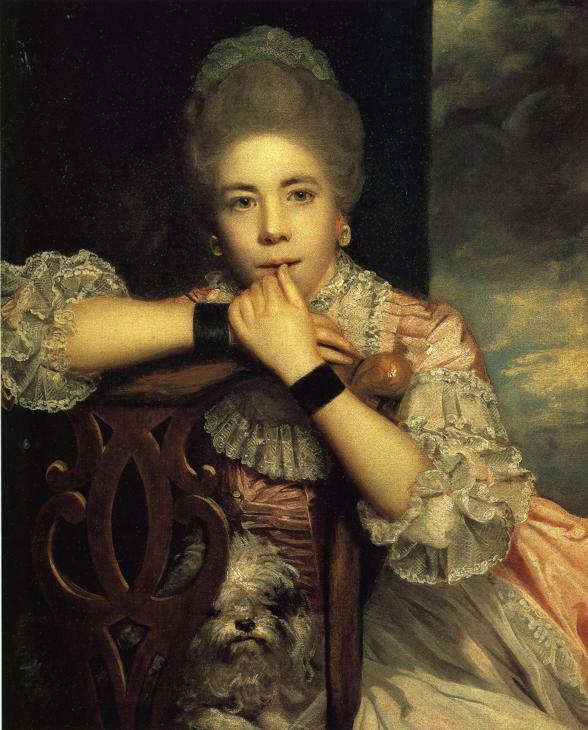 In 1773 Frances had made it onto Harris's List of Covent Garden Ladies, a notorious listing of prostitutes, which reported that James Abington had "sold her to Mr.--- for 500L. and entered into the articles never to molest him in the possession of her." Sold the divine Ms A?! I doubt she was a woman to be sold! Well, at least not by someone besides herself. By this time the couple had separated and were living apart. Frances had even taken up with a rich MP.